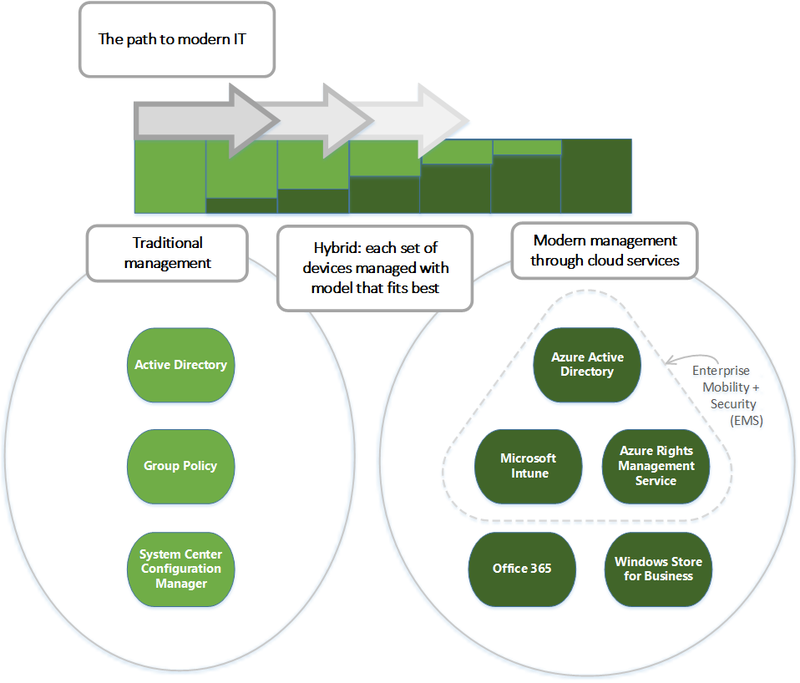 Manage Windows 10 in your organization – transitioning to modern management | just another windows noob ? ← System Center Configuration Manager 1610 Technical Preview now available ! Use of personal devices for work, as well as employees working outside the office, may be changing how your organization manages devices. Certain parts of your organization might require deep, granular control over devices, while other parts might seek lighter, scenario-based management that empowers the modern workforce. Windows 10 offers the flexibility to respond to these changing requirements, and can easily be deployed in a mixed environment. You can shift the percentage of Windows 10 devices gradually, following the normal upgrade schedules used in your organization. Your organization might have considered bringing in Windows 10 devices and downgrading them to Windows 7 until everything is in place for a formal upgrade process. While this may appear to save costs due to standardization, greater savings can come from avoiding the downgrade and immediately taking advantage of the cost reductions Windows 10 can provide. Because Windows 10 devices can be managed using the same processes and technology as other previous Windows versions, it’s easy for versions to coexist. Your organization can support various operating systems across a wide range of device types, and manage them through a common set of tools such as System Center Configuration Manager, Microsoft Intune, or other third-party products. This “managed diversity” enables you to empower your users to benefit from the productivity enhancements available on their new Windows 10 devices (including rich touch and ink support), while still maintaining your standards for security and manageability. It can help you and your organization benefit from Windows 10 much faster. Read the rest on Technet here. This entry was posted in Azure AD, EMS, Intune, System Center Configuration Manager (Current Branch), Windows 10. Bookmark the permalink.